Mulching is a great way to keep your landscape protected during the winter months. It can provide a layer of warmth to prevent frost if you live in some of the upper elevations where the temperatures sink low enough for that to be a problem. In the spring, mulching helps to refresh the look of your landscaping while also encouraging healthy growth. Mulch is especially important in the Arizona landscape since it protects the ground from the scorching temperatures and helps to retain some of the moisture. With the right mulching, you won’t have to water your plants as often – saving time and precious resources – and you won’t have to weed as often. The problem with mulching is that it can attract termites and encourage an infestation. Termites can take up residence in the mulch, which could be in a bed right next to your home, and then travel through the mulch and the soil into the walls of your home or even the foundation. Once they are in your home or the foundation, they can cause extensive damage. There are a few things you can do for termite prevention that will protect your home while allowing you to continue creating a beautiful landscape. First, do not allow mulch to come in direct contact with your home, even if you have a brick or stucco exterior. Make sure there is at least six to 18 inches of space between the mulch and your home. You can use a nice rock barrier to create a decorative element, or you can just allow the mulch to taper off naturally into the soil, leaving that natural barrier. You’ll have to be more vigilant about the weeds in that un-mulched area, but at least you won’t have to worry about termites. Next, make sure you protect any Mesa termite treatment you have invested in, such as a barrier treatment. Do not move any of this treated soil to other areas of your landscaping or vice versa. Even moving soil out of the treated area can compromise the treatment since it reduces the protected area. Of course, xeriscaping is a great choice for Arizona landscaping, and it does not require any mulch. You can use sand or garden pebbles to cover the area that you want to landscape and then plant desert-hardy plants. If you do use mulch, it is important that you regularly inspect the area around your foundation, even if you are taking measures to avoid infestations such as using a natural barrier or getting a termite treatment. If you have termites, you will see signs such as small mud tubes in the soil. These tubes are only as wide as a pencil. You want to note their location, particularly if they are leading to your home or are anywhere close to it. If you don’t feel confident performing this inspection yourself – either because you don’t know what to look for or because you aren’t sure you’d recognize all the signs – you should hire a professional to perform the inspection. Most exterminators will inspect your property at no charge and will give you feedback about what you can do to protect your property, as well as what you can do to get rid of any termites that have taken up residence. You still have a few months until the spring weather makes termites active again, but it is important that you think about these issues now when you might be mulching or planning for spring mulching. Varsity Termite and Pest Control will provide a free termite inspection of your home and your landscaping to make sure you are protected. 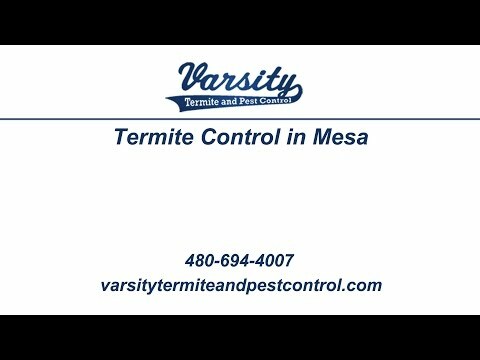 Our professionals provide a variety of termite treatment options, including termite prevention in Mesa measures. It is our goal to keep your home protected from invasive and destructive termites that can undermine the value of your property and cost you thousands in damages. We also provide treatments for scorpions and other pests. Call us in Arizona today to schedule a free termite inspection or to learn more about our termite treatment options. Check our website for current specials, or check out our reviews online to see what our customers are saying about us.